UPDATE: Time confirmed for 9pm, 1 January 2014 on BBC1. The BBC have finally nailed down the date for the long-awaited third series of Sherlock. 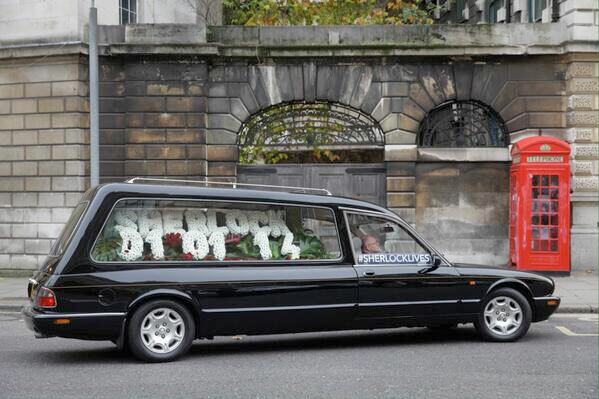 As was rumoured, Series 3 will begin on 1 January 2014 on BBC1. Two years after the second series began. The date was confirmed through a publicity stunt involving a black hearse (pictured right) which was spotted driving through London earlier today. The Radio Times adds that episode two, The Sign of Three, will air just four days later on Sunday 5 January, with the third and final episode, His Last Vow, on Sunday 12 January. The series kicks off with The Empty Hearse. Two years after the devastating effects of The Reichenbach Fall, Dr John Watson has got on with his life. New horizons, romance and a comforting domestic future beckon. But, with London under threat of a huge terrorist attack, Sherlock Holmes is about to rise from the grave with all the theatricality that comes so naturally to him. It’s what his best friend wanted more than anything, but for John Watson it might well be a case of ‘be careful what you wish for’!